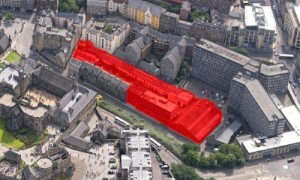 I was shown round the King’s Stables Road site on Tuesday by the council’s surveyor. There are various buildings some of which will need demolished and others that could stay. A fairly small part of the land has most of the value to a developer so there is undoubtedly room for discussion on some, possibly even much of the land being used to help develop an arts quarter. The council are looking for something more interesting than simply a hotel, flats and a couple of shops if the area and its footfall are to be improved as they wish. While there has been a lot of interest in the site from developers there has also been a lot of interest in The Evening News article and the plan will be that when the council announces its short list at the end of October some of those short listed will be people we have had discussions with. Much of the chances of success will be based on “credibility and deliverability” so hopefully we now have all bases covered. If we are successful then there can be more detailed discussions about how we best use the space secured. I can only thank everybody for their good wishes and interest. This will of course only be a small part of a larger plan and I’m told there will still be a public meeting in The Usher Hall in November to discuss in particular live music. Just read this so not sure how old it is. Really hope something can be done and think that this area would be prefect as an ‘artisitic hub’ Recently visited Camden Market and thought a space similar in Edinburgh would be great. Or even something close to Metelkova in Slovenia. Good luck!